Medium - £36.99 Only 1 left! Shake that dorsal fin, girl! So, you know those cute orange, black, and white saltwater fish who like to swim in the anemones at the bottom of the ocean? Yup, those adorable little fishies are actually called "clownfish" but have you ever wondered why they are called that? We think it's because they are actually very funny fish, funny like "ha ha" funny. These anemone-loving fish are real jokers and like to make sting rays, starfish, and even sharks chuckle. 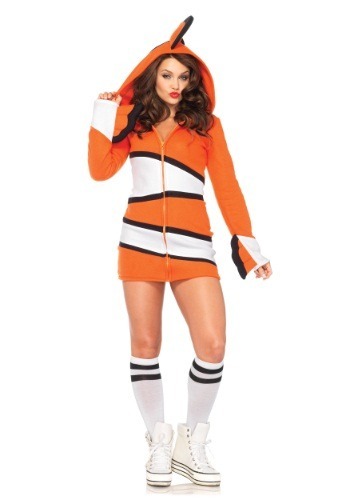 If you're a charismatic gal who likes to be the life of the party while telling silly jokes to other party goers, then this cozy clownfish costume is perfect for you! So, it's best that you find yourself a cuddly sea anemone, because this snuggly plush costume will make you feel like it's cuddle time as soon as you put it on! With bright oranges and daring whites, this hoodie-style dress combines the cute look of the saltwater fish with a comfortable and cozy style that is as comfortable as it is adorable. We suggest that you don't get yourself lost, otherwise you might end up in a fish tank full of strange characters and we both know that you're the type of girl who needs a wide ocean to swim in! 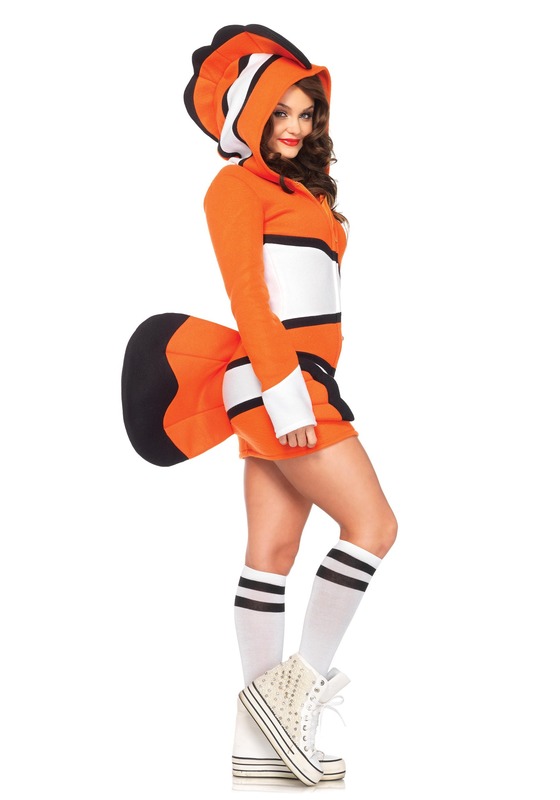 An attached tail on the back gives it an added adventurous look, so you can swim through any costume party like a true fish! Just add some high-top sneakers and a pair of athletic socks to your look to achieve the sporty vibe. It's great for any girl who's trying to make a big splash at the upcoming costume party!